You're wondering why to use a polarizing filter. They're most often used to darken blue sky or to reduce reflections. These filters are very useful in landscape photography. Your photos will also gain a little bit of saturation. The effect that one of these filters has depends on the direction of the light in relationship to the orientation of the lens. There are two qualities that they should have to get the maximum benefit in your photos These filters must be able to rotate after you screw them on so that you can adjust your filter to the direction of the light. Secondly, they should be multicoated to reduce reflections on both sides of the filter. Because they will reduced the reflections on leaves and foliage, your photo will have better saturation of colors. Let's dive in and take a look at a side by side comparison of images taken with and without a polarizer in an outdoor setting. This was a real quick photo assignment I gave myself to illustrate the effect of a PF (polarizing filter). I grabbed my Canon 5d DSLR with the 24-105 zoom lens attached and the filter from my camera bag. My lovely bride of 33 years was napping on our hammock. Of course while in a hurry, I grabbed a 55mm filter for a lens that needs a 77mm filter. In the photograph on the right, I simply gripped the PF by its edges and held it flush with the front of the lens. Look at the difference! Not only did the sky turn a beautiful blue, but we also got more color saturation in the foliage. 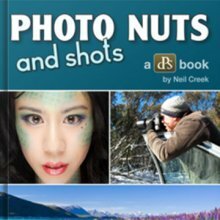 Many landscape photographers wait til they get back to their computers to darken the sky or add saturation to their photos. You may not want to waste time at the computer. You'd rather get those beautiful skies recorded at the time of image capture. that's one of the advantages of using the filter when you take the photograph. The biggest advantage of using a polarizer is reducing reflections and cutting down on the glare that reflects off of smooth objects. Reflections from water is the best example of this undesirable effect. 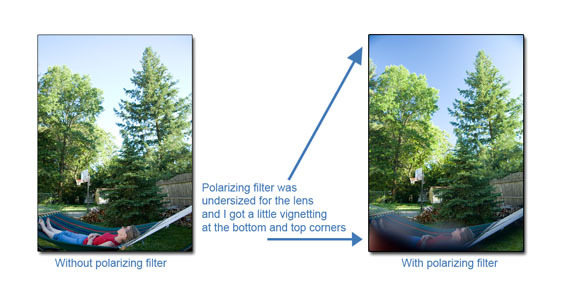 Here's a great comparison of before and after photos you get by attaching one of these filters to your camera lens. 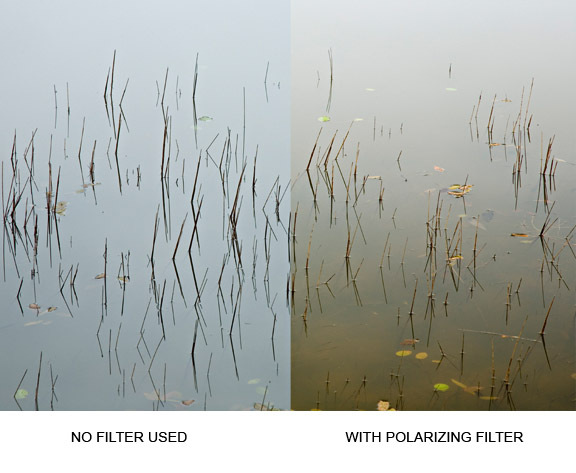 Many photographers scoff at the idea that you need filters anymore. There are so many photography apps and editing programs that do a great job creating effects after you take you photos. This is one effect that cannot be achieved by using an app or editing software. Here you can see that the filter reduced the reflection from the white cloudy sky. In the photo on the right, you can see the leaves of the lily beneath the surface of the murky green water. Had there been any fish in the water at the time you would have easily seen them. No editing software in the world would be able to see through the reflection afterwards. One way to cheat is to use sunglasses that have polarizing lenses. This will only work with "point and shoot" or smaller cameras where the lens size is not big like a DSLR lens. Make sure the sunglass lenses are clean and free of scratches. Also realize that sunglasses don't have near the same optical quality as a professionally manufactured photography lens filter. The best part about using a filter that polarizes the light is that you can see what the effect is going to be before you take the photograph. 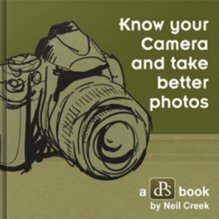 You can hold the filter up to your eye, or hold it up to the lens and look at your digital camera's LCD screen or viewfinder. Of course the best way to high quality is to use one that screws onto your lens. This is an option if you have a DSLR and an option for some point and shoot digital cameras as well. 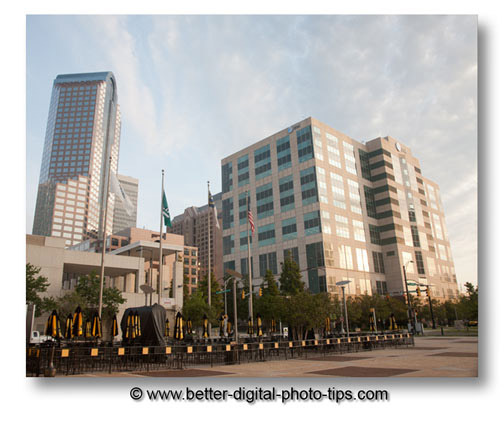 Look at the dramatic difference in the window reflections of these two photos below of Charlotte NC buildings. This top photo was taken with no polarizing lens filter. Water isn't the only smooth object that reflects the sky and affects how your photograph comes out. Windows are another great example of an object that reflects and a polarizing filter can reduces those reflections significantly. Look closely. 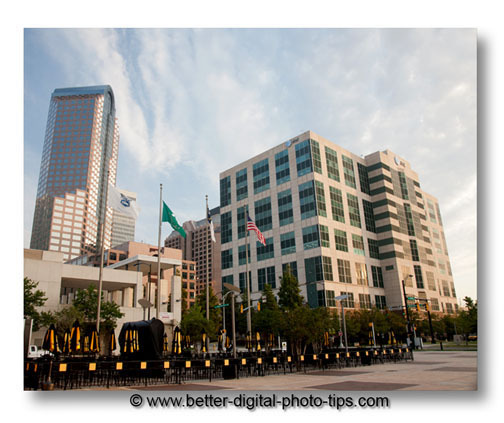 Compare the reflections on the front and right sides of the building in the photo above with the photo below. Look how dark the windows appear in the absence of reflections, particularly on the building on the right in the photo. This is a case where I actually prefer the non-polarized lens photo more. The reflections on the windows in the window add some dimensionality by making the right side of the building brighter. You can see that using the polarizing filter does add some contrast and saturation to some of the shadows and midtones in the photograph. This building is in Charlotte, NC. For more Charlotte NC Photos. Must be circular. 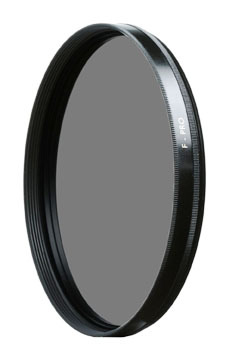 Circular polarizers allow you to rotate the filter without unscrewing it from your lens. Since the direction of light changes may change with the situation you're in, it is essential to be able to rotate the filter to control the amount of polarization you want to achieve. Must be multi-coated. Lenses themselves will reflect and scatter light, resulting in degradation of image quality. Properly coated lenses give much better image quality. Pricing. You get what you pay for and buying a really cheap polarizing filter will give you disappointing results. On the flipside of that, there's no reason to spend a ton on a filter just because some professional landscape photographer recommends a specific brand. Read the reviews of actual, real buyers. These filters are available in many stores and online sellers too. The better ones are circular polarizers. That means they have a rotating ring that turns independently of the screw-on ring. 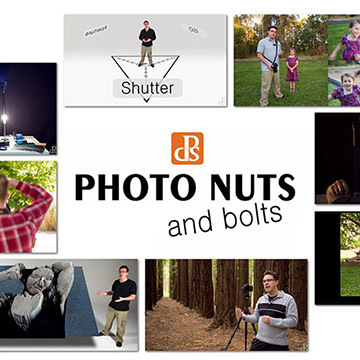 This gives you the ability to adjust the amount of the effect on your photograph.